Whether you are an instructor of biology, chemistry, geology or another science, you want to inspire in your students a love for the field. Even if they do not go on to become scientists themselves, they can take the lessons from your class to have a stronger understanding of the world around them. However, these goals cannot be achieved if there is a a failure to effectively communicate the ideas and theories. As a teacher, you probably realize how many students struggle with science and not being proficient in English can make it difficult to learn science. However, by understanding the learning needs of the ESL student, you can overcome their communication struggle and help them get excited and learn the concepts. The battle between science and religion has a notoriously prominent role in the culture of the United States. People often pit these two entities against each other when there really could be a mutual understanding between the two. You cannot assume that your ESL students come to your science classroom with the same experience from their home countries. Many students might be bringing very strong religious beliefs to the classroom. For some of them, evolution, for example, could be a very offensive concept. Despite these differences in opinions that you and your students might share, you still need to teach the required material. Presenting the material in an objective way is extremely important. For example, explaining that Charles Darwin investigated evolution is much different from stating that evolution is the only correct way to look at the world. Once you have come to recognize that cultural and religious gaps may exist between your ESL and non-ESL students, you can begin to employ other strategies that will aim for high levels of learning and comprehension across the board. Subjects are taught in all different types of ways, and you cannot assume that students had the same type of instruction in another country. For example, in the United States, taking biology before chemistry is a fairly standard sequence of events. Let's say that you are introducing a concept in chemistry, and you have several students in your class who just moved from a different country this year. If you say, "This concept is like what you learned in biology last year..." without explaining further, you have already lost that percentage of students. When students start a chemistry class, they likely have an idea of what the course is going to be about. They know about specific chemicals, and they can relate the concept of "chemicals" to the title of the course. The same holds true for a biology class. They have likely heard words such as "hibernation" or "pollution" in the earlier grades. Unfortunately, if the ESL student has recently come to the U.S., they may not have learned the simple science words in earlier grades and they could have difficulty understanding more advanced vocabulary connections. As a teacher you may need to step back and review some of the simple vocabulary which was presented in prior years, before you can go on and present science materials for the higher grades. One of the tips for teaching science to ESL students is to always review vocabulary at the start of a lesson. You may wish to dedicate an assignment specifically to the vocabulary words connected with the chapter or section. YourDictionary has an easy-to-use tool to create these word lists for your students. Less intimidating places to communicate with other students versus large group discussions with the entire class. Unfortunately, some teachers have started to show labs on DVDs as opposed to actually getting students to participate in them. Whenever possible it is always preferred to involve ESL students in lab environments and other small group learning experiences. Remember that just because they don't speak English fluently it doesn't mean that they don't understand the concepts you are teaching. Simplify your teaching language. Shorter, simple sentences are easier to understand than complex sentences with idioms. Use visuals whenever possible instead of words. Many times an ESL student will recognize a science concept from a visual, even more so than a written description. Don't draw attention to the ESL student if the attention seems to make them feel uncomfortable. Encourage participation from the ESL student, both in asking and answering questions. Encourage team and group work to encourage participation. Depending on the comfort level of the ESL student, consider making the ESL student the team leader. The goal of a science class is to teach science, not English. However, by learning content such as science, an ESL student can broaden their English vocabulary and their comfort level with verbal and written communication. Whether you are teaching about the solar system, the chemical interactions or the evolution of man, science provides interesting and challenging content for the student who is trying to incorporate English into their everyday conversations. "Tips for Teaching Science to ESL Students." YourDictionary, n.d. Web. 22 April 2019. 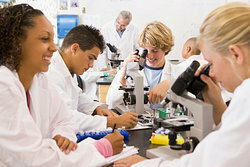 <https://esl.yourdictionary.com/esl/esl-lessons-and-materials/tips-for-teaching-science-to-esl-students.html>. Whether you are an instructor of biology, chemistry, geology or another science, you want to inspire in your students a love for the field. Even if they do not go on to become scientists themselves, they can take the lessons from your class to have a stronger understanding of the world around them. However, these goals cannot be achieved if there is a a failure to effectively communicate the ideas and theories.As a teacher, you probably realize how many students struggle with science and not being proficient in English can make it difficult to learn science. However, by understanding the learning needs of the ESL student, you can overcome their communication struggle and help them get excited and learn the concepts.